Health and plastic | Retired? No one told me! We need collective action by consumers as well and we all know how powerful a consumer can be…Don’t we? Individual consumer choices are important as is collective action which can really make a difference. But what a difference that would make…How easy is that to action??? Now for the good news stories...or is it? Rivers…They flow into the sea…Do you have a river near you? Is it clean are the fish abundant or is it like this? Food wrappers, including crisp and sweet packets, were the second biggest form of plastic pollution in rivers, followed by cigarette butts. All of these forms of litter can cause problems for wildlife and fish and are hard to clean up once they have found their way into the water. Vanuatu is an island country located in the southern Pacific Ocean. The official name of the country is the Republic of Vanuatu. Its closest neighbours are New Caledonia (France), Solomon Islands, Fiji, and Tuvalu. The country is located some 1,750 kilometres (1,090 miles) east of northern Australia. Vanuatu has 3 official languages: Bislama, English and French. This entry was posted in Bamboo Straws, Bioplastics, Health and plastic, Microplastics, Plastic and the inside of cans The Dangers, Plastic bottles, Uncategorized and tagged Compostable products, Cotton wool buds, Glitter, Michael Gove, Microplastics, Plastic bottles, Plastic cup stirrers, Plastics, Straws, Vanuatu on April 8, 2019 by CarolCooks2. Blue Planet UK is a week-long documentary series produced by BBC Studio’s Natural History Unit, the team behind Blue Planet and Blue Planet II. The programmes will offer audiences practical solutions for how to get involved around the country and tackle plastic pollution, according to the BBC. Sounds good, right? When does it start…TONIGHT! Blue Planet UK will air Monday 25 to Friday 29 March on BBC One. Let the fun began…Simples? It is not! So I have simplified it a little for you( and me) I have grouped the numbers into good and bad and given you a little background…my advice is to do some of your own research as well if you have any concerns about how plastic may affect your health and your family’s health. Group One. Are what I class as the baddies and I avoid like the plague. This is the most commonly used plastic for consumer products which include:- Water bottles, soda bottles and some food packaging. It is intended for single use only….One time usage…as reusing increases the risk of leaching and bacterial growth. It may leach carcinogens and should NOT be reused. A soft, flexible plastic which is used to make clear plastic food wrapping, cooking oil bottles, teething rings, children’s and pets toys. PVC is known in many circles as poison plastic it contains many toxins which can leach throughout the life of a product. It should not be re-used. Used to make styrofoam drink cups, take out containers, egg containers, plastic cutlery and foam chips for packaging. It may leach styrene which is a possible human carcinogen into food especially a risk when food is microwaved. Chemicals used in the manufacture are linked to human health and reproductive system dysfunctions. Should be avoided where possible. This is a known endocrine disruptor also this group 7 is a group for anything which doesn’t fit into the other categories. Found in food containers labelled PC, baby bottles, sippy cups some of which are now labelled non-leaching but it is still possible.. THERE IS A NEW GENERATION OF PLASTICS BEING DEVELOPED TO REPLACE POLYCARBS USING POLYMERS LIKE CORN STARCH. #7 should not be reused and where possible avoid using for children. Group 2 are better but I always look for alternatives where I can as in glass bottles. A stiff plastic used for milk containers and detergent containers. toys and some plastic bags. Considered the safest form of plastic…Reusable and recyclable. Used to make shrink-wrap, squeezy bottles, bread wrappers. Considered less toxic( what is that supposed to mean) and relatively safe for use. This plastic is tough and light and a barrier against moisture, grease and chemicals it is used as a cereal box liner… the bag your corn flakes are in…used for bottle tops, margarine and yoghurt pots, potato chip bags and straws. These symbols are generally found around the base or on the bottom of bottles. It is also the number which is found inside the recyclable arrows which tell the real story behind your plastic. It is not just our health and our families but the worlds health, animals and the enviroment even the Queen of England has banned the use of plastic bottles/straws on her estates. I know this is based on helping the enviroment but my families health is also important and I think the two go hand in hand. Sally’s post on plastics added even more fuel to the fire that has been burning inside me for a while not just health wise but environmentally. Tomatoes were easy and so much cheaper than in cans as well…they freeze well and cost wise I am saving over 100% based on my usage. No brainer and quick to do…I just put boiling water over the tomatoes and skinned them. Then I had a thought..yep…I put the skins with a little of the tomato juice in my small blender and viola blended smooth you wouldn’t know they were skins and a lovely bright red colour so I added to the tomato pulp which brightened the colour. 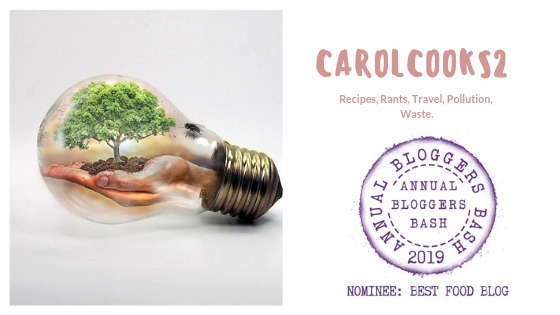 This entry was posted in Carol Cooks2, Health and plastic, Plastic and the inside of cans The Dangers, Plastic bottles, Uncategorized and tagged Blue Planet, Leaching, Plastic bottles, Plastics, Symblols, Tinned Tomataoes on March 25, 2019 by CarolCooks2. Welcome back… How is your war on waste working I have had many notes from my readers on what they are doing to combat waste and it makes me happy that so many care about the world we live in. Today I am going to look at how we can reduce waste of single-use plastic bags in the home. Use a reusable shopping bag. A single plastic bag can take 1,000 years to degrade. Purchase or make your own reusable produce bag and be sure to wash them often! Give up gum. Gum is made of synthetic rubber, aka plastic. I get so angry when I am walking and gum gets attached to the bottom of my shoe…If you have to chew wrap it and put it in a bin when you have finished… However, if you click the link you may not ever want to chew gum again. Buy boxes instead of bottles or glass bottles instead of plastic as they are recyclable. Cereal, pasta, and rice buy from bulk bins and fill a reusable bag or container. It saves money and unnecessary packaging. Avoid buying frozen foods because their packaging is mostly plastic. Even those that appear to be cardboard are coated in a thin layer of plastic. Plus you’ll be eating fewer processed foods! Don’t use plastic cutlery at home and be sure to request restaurants do not pack them in your takeaway box. Make freshly squeezed juice or eat fruit instead of buying juice in plastic bottles. It’s healthier and better for the environment. I support the initiative to ban single-use plastic bags in your store at ….. I hope this ban is the first step in which ……. your company shows vision and leadership in the region and perhaps in the nation by taking bold actions to reduce waste and litter and protect and improve local wildlife and marine life. People coped before plastic bags and will do so again. Without easy access to free bags, one quickly becomes accustomed to their own reusable bags. I would also like to take this opportunity to thank you for the steps you have taken already by having days in the store where plastic bag are not available and by using banana leaves as packaging rather than a plastic bag…I would though like to bring to your attention the piece of plastic in the sushi packaging I noticed the other day could it not be cut from a banana leaf? We just washed and cut and stir-fried with a little garlic and oyster sauce it made a nice vegetable side dish. It was a vegetable which none of us had seen or tried before and which I love about this market as the food is local and many of the fruits and vegetables not really grown commercially but by local people and farmers. The red Noodle snake beans were also a new variety for me very similar to the green and quite a rare bean so I will enjoy them while I can. It holds its colour when cooked and ideal for salads and stir-fries. Notice how they are tied now with banana leaf and a bamboo tie instead of in a plastic bag and I think it is so much nicer isn’t it? This entry was posted in Cooking from scratch, Health and plastic, No to food waste, Plastic bottles, Uncategorized, Waste not want not and tagged Plastics, recycling, red noodle beans, Snake beans, Waste not want not on November 22, 2018 by CarolCooks2.